The Anime Almanac » Blog Archive » The Worst Packaging Ever? So like I mentioned in my previous post, I’ve been receiving quite a lot of review material from FUNimation lately. While I’m never going to have the time to get to watch all these new releases and re-releases, it does give me a chance to scope out the current new offering in the R1 market. But being able to see all these new releases has made me realize that lately the packaging from FUNimation has been a real crapshoot as far as quality goes. This comes from the company trying to cut costs in a dying DVD market and from trying to ship out the massive amount of new catalog they acquired from Geneon and ADV. The result seems to be that no two packages are alike. They’re all made up of different sizes, cases, structures, and designs. But one such package I received from them recently was so incredibly bad that I simply could not do it justice describing it on Twitter. 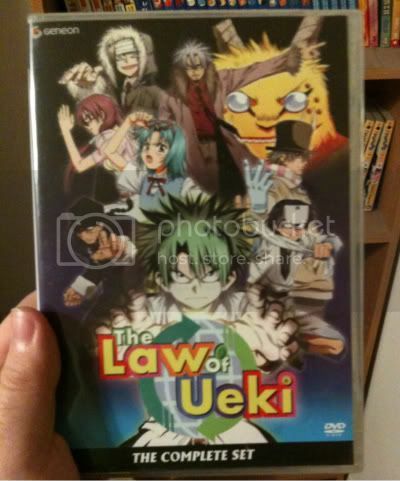 So please allow me to take you through a photo tour on what must be the worst anime packaging ever. Front, back, spine… these two double-sized DVD cases are 100% identical. They both even have the same UPC bar code on the back. So as I’m starting to figure out what I’m going to do with my extra copy of Ueki, I crack open the box to see what’s inside. Holy crap, they’ve got a lot of DVDs crammed in there! 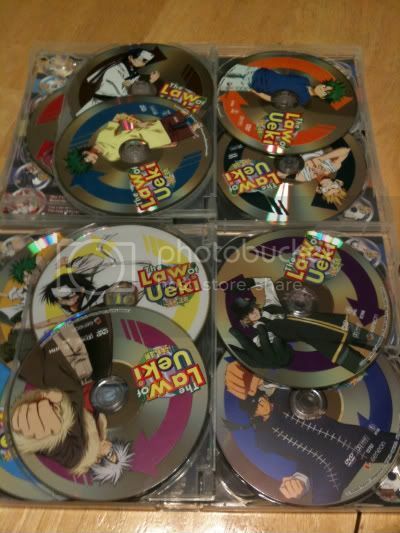 In fact, when you combine both cases, you’d count 11 discs in total. Hold on! Eleven DVDs divided among two cases… that doesn’t make sense, eleven is an odd number. So I go back and count each case again. Oh my god, this case has one more DVD than the other! Oh my god, they’re all different DVDs! 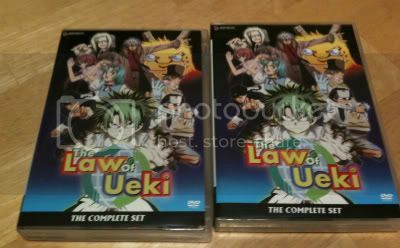 Yes, the entire Law of Ueki series is made up of 11 DVDs, and they are spread across both cases. Both identical cases. The first problem this presents is, “well, how do I know which case has the first half of the series and which case has the second half of the series?” Well, from the outside, you can’t. Again, both cases are 100% identical. If you were to place them on your shelf, it would look like you have two copies of the same series. Okay, so I open up one case to see if it contains the first half of the series or the second half. Don’t bother looking too closely, my dear reader, because you’re not going to find a volume number on the disc. This is an 11-DVD series boxset, and not a single one of the discs are numbered. Wait, what’s that behind the DVD? It looks like there’s something on the reverse side of the DVD sleeve. There it is! There’s your episode guide! 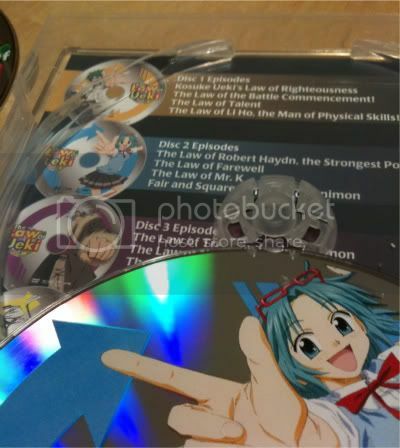 FUNimation was kind enough to give you a helping hand in figure out which DVD you’re supposed to start off with. It is as if the designers at FUNimation had specifically engineered this set to be as confusing and frustrating as possible to the end user. Just what were they thinking? 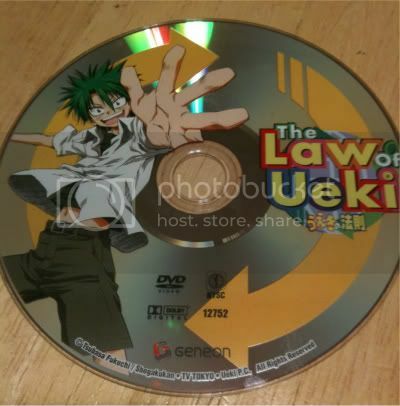 Now I know that I should put the blame for the unnumbered DVDs on Geneon, that was something that they liked to do and FUNi is just repackaging their old DVDs. However, making the two separate cases identical and then hiding the episode guide behind all the DVDs, that’s all FUNi’s fault. So shame on you, Mr. FUNimation, for making this blogger go nuts just trying to figure out which DVD to pop into his player first. Shame on you. This entry was posted on Friday, June 26th, 2009 at 11:50 am by Scott	.